Mexican | Blog, Jane! Blog! Cook quinoa according to directions on package. (I cooked mine in the Pampered Chef rice cooker). After it is cooked, toss lightly with taco seasoning. In the center of each tortilla spread 1/4 cup refried beans. Then spread 1 tbsp of sour cream on top of refried beans. Top with 1/4 cup quinoa. Then sprinkle 1-2 tbsp cheese over top. Roll into enchilada. These were a super simple yummy meal that I made the other night. Even easier since I had browned the ground beef the previous day when making pizza burgers! I found these at Lynn’s Kitchen Adventures and the only change I made was to add some onions, and even though I’m not a huge fan of onions, I like the flavor in many dishes, including this one! 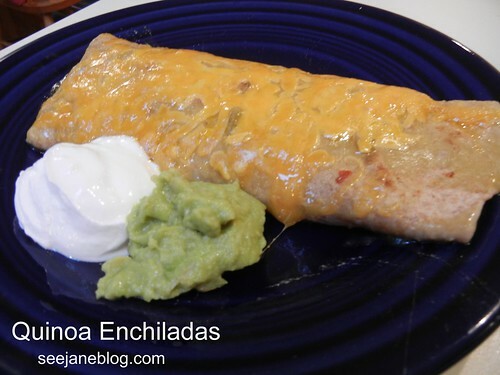 Combine 1 cup of jack cheese, 1 cup of cheddar cheese, cream cheese, 3/4 cup (or so) of enchilada sauce, and beef. Mix until well combined. Pour about 1/4 cup of enchilada sauce into a 9×13 pan and spread it around. 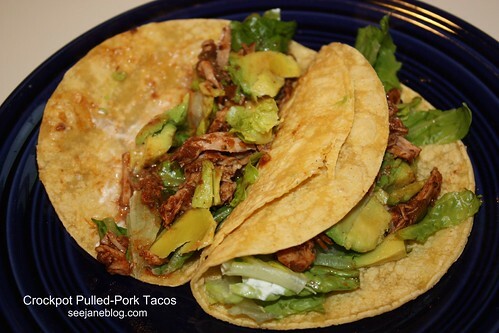 Than place about 1/4 cup of filling into each tortilla shell. Roll up and place in pan. Pour remaining sauce on top and sprinkle with the rest of the cheese. Bake at 350 for 25 minutes or until heated through. Since I knew we were going to be gone most of the afternoon, I thought a crock-pot meal would be the best and easiest way to get dinner on the table tonight. I found this recipe through bettycrocker.com and only changed it up, because I couldn’t find frozen stir-fry bell peppers at the grocery store. I substituted fresh bell peppers instead. Oh – and I just realized I forgot to add the salt. It was very good (although a bit drippy) and with just the two of us (Maria ate separately and went to bed before we ate) made plenty for leftovers later this week and some in the freezer for future. And I will definitely make this again. I like that it can cook for 10 hours, so it’ll work for days I’m working! Place pork in 3- to 4-quart slow cooker. Place onion on top. Mix barbecue sauce, salsa, chili powder and cumin in small bowl; pour over pork and onion.